Good Morning.. Hope you are all having a great week so far! 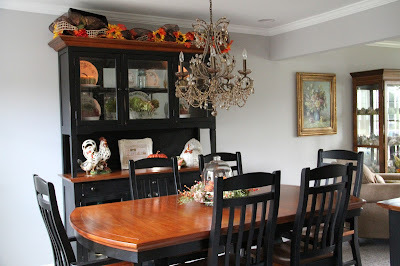 When we remodeled our living room / dining room , we got a new dining room set. I hadn't decorated the shelves of the hutch until yesterday .. My daughter was digging around in our basement and found some of my old dishes. They are cream colored Pfaltzgraff with grapes and leaves..I wanted plain cream ones to display but these are free :) . 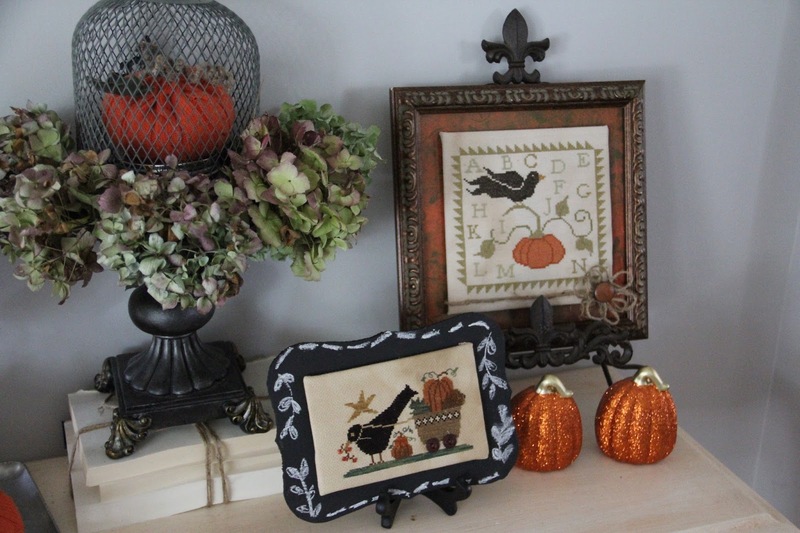 I moved the Pumpkin cottage cross stitch piece from the foyer and added a silver tray with a glitter pumpkin , sunflowers and dried hydrangea. I added a couple pumpkins, pumpkin plates , a vintage blue mason jar, and a basket of dried hydrangeas to the inside of the hutch. A little fall vignette on the server.. plates stacked with a pumpkin, ivy, sunflowers, and those green floral balls, in a wrought iron basket. 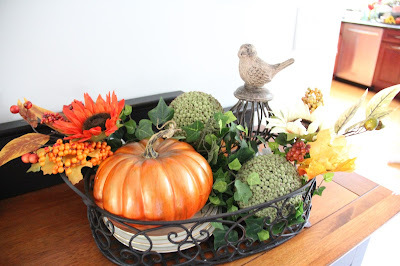 On the table is a big cloche with pumpkins , lace, dried hydrangeas and berries on a silver tray. 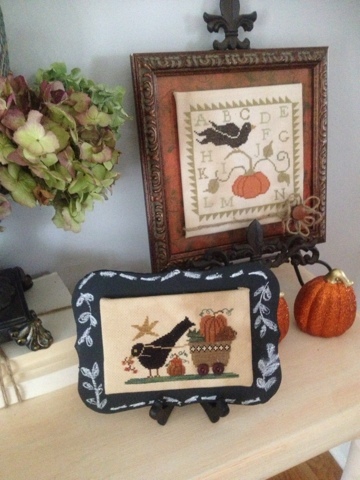 I had finished stitching 2 fall cross stitch pieces , I found the frame below at the good will, for $3.99. 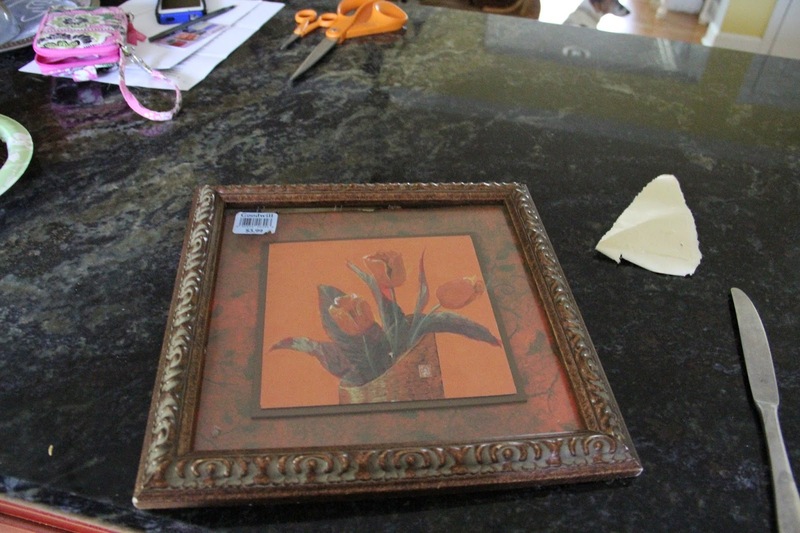 I took out the glass and just left the frame and matting in . II then attatched the stitching to foam board and glued it to the frame mat. I wrapped a piece of twine around the bottom and glued twine to a button to make a flower.This stitching is a free pattern from with thy needle and thread blog . I love how it turned out. For the next stitched piece, Homespun Elegance , delivering Autumn.. , I bought a cutout wood shape at Michaels. I painted it with chalkboard paint . Then glued the stitched piece to the chalkboard and added some doodles with chalk. I love how they both turned out. Thanks as always for your visits and nice comments ! Have a great day ! 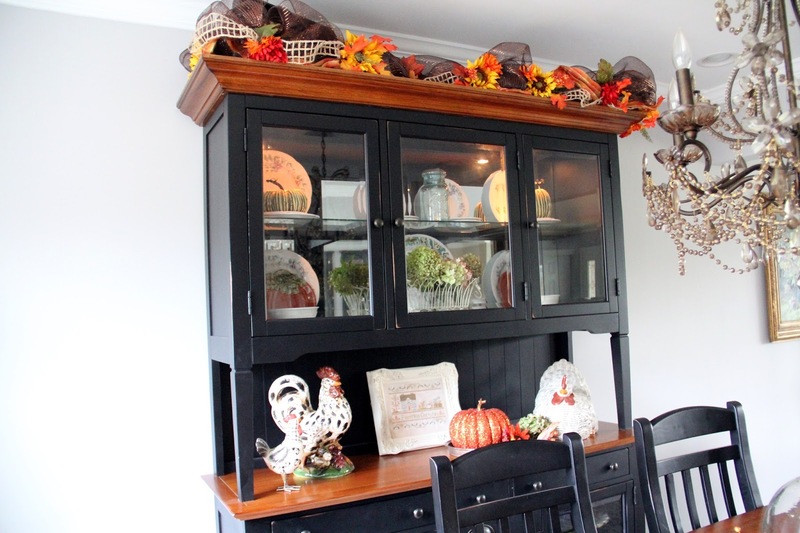 Lovely fall decorating. Your 2 framed pieces are awesome - so creative! Everything looks so nice! Love the chalkboard frame! Perfect finish for this design. I think I may have to borrow this idea! Ok, me again. I have gone through about 2 years of posts. I don't know if I have ever been here before, but I am adding you to my blogroll. I wish I had 10 percent of the energy you have! I mean you and all your crafts...and Christmas trees. Oh, all is so beautiful and I love all the homemade touches! 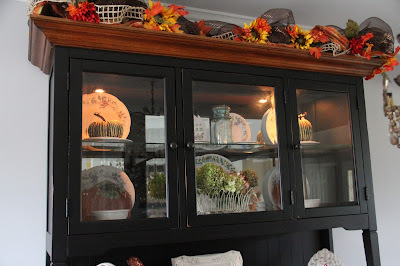 Your fall stitches look so pretty and the fall decorations on the hutch are perfect! 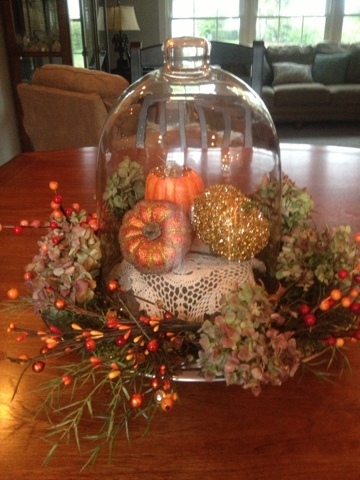 I love all of your Fall touches Priscilla! I will get mine down from the rafters tomorrow, and spend a couple of days putting it out. It looks wobderful! Very nice deco! I love the garland on top of the china cabinet, very cute! It's all pretty, but I like how you framed the cross-stitched pieces best! I should say that both finishes are perfect! Your creativity never ceases to amaze me! 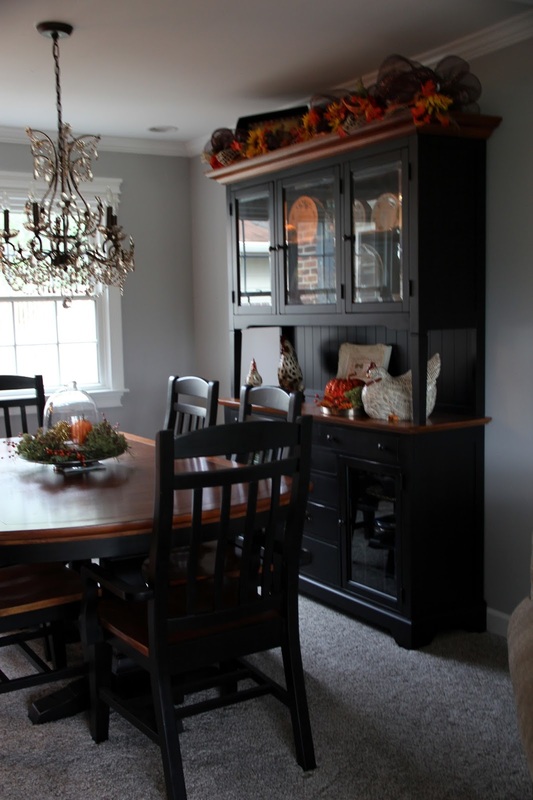 And your dining room is the perfect fall setting! 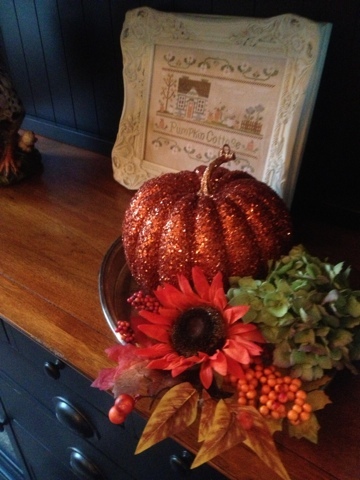 Fall has definitely arrived at your house! 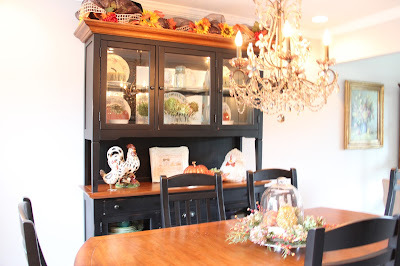 I love what you did with the top of the hutch - it looks great! Love how you've finished both of your fall pieces, Priscilla--what a great idea the chalkboard is :) I have that HE piece--really should stitching it soon!! Your dining room is lovely with all the fall decorations. 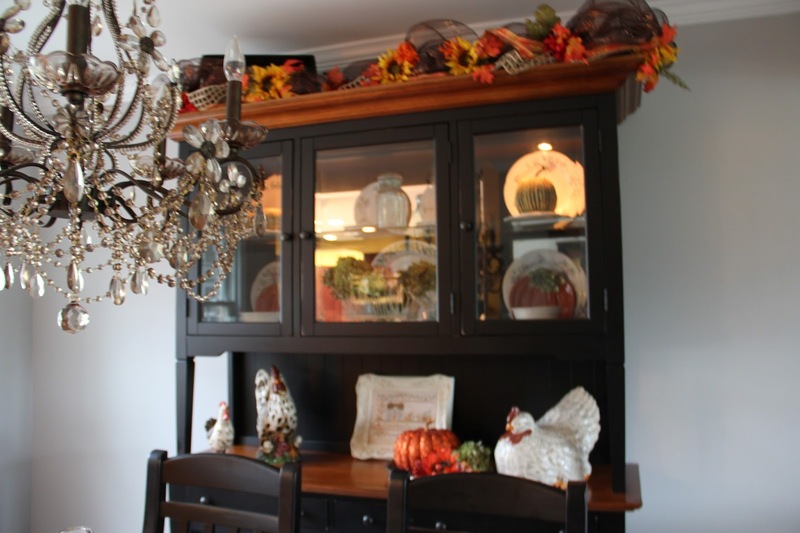 I especially love the buffet and how you arranged all the fall accessories. The two stitchings are so beautiful framed and each is so different and I could not pick my favorite. Great Job! 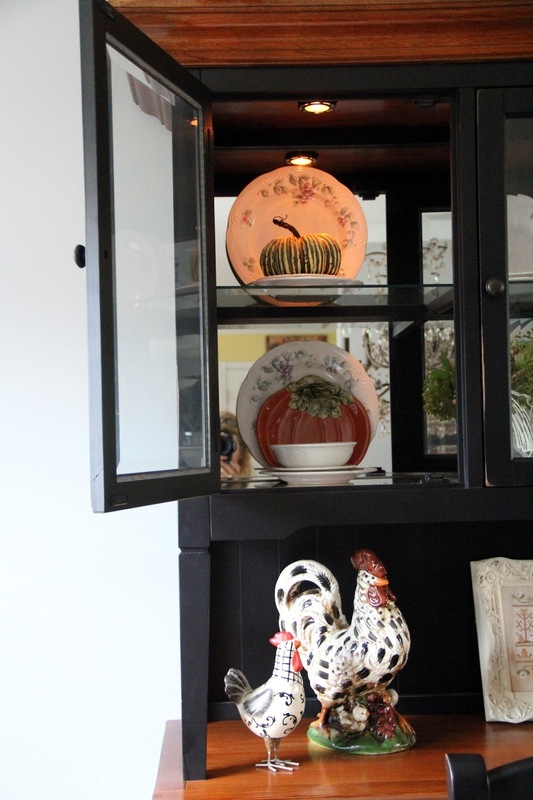 Both your hutch and your cloche look fabulous! I like the new projects you completed, love the extra touches on the framing! 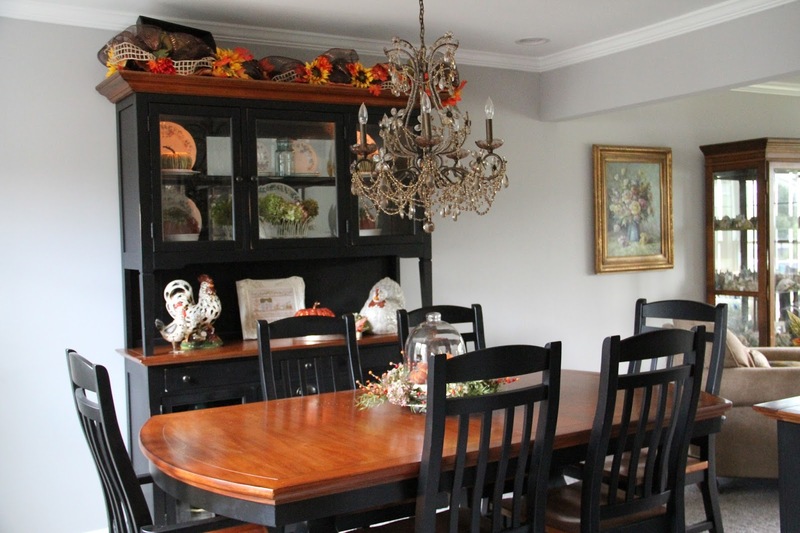 Pretty dining room. I love how your pictures turned out. Great job. The cross-stitch is just fabulous Priscilla! 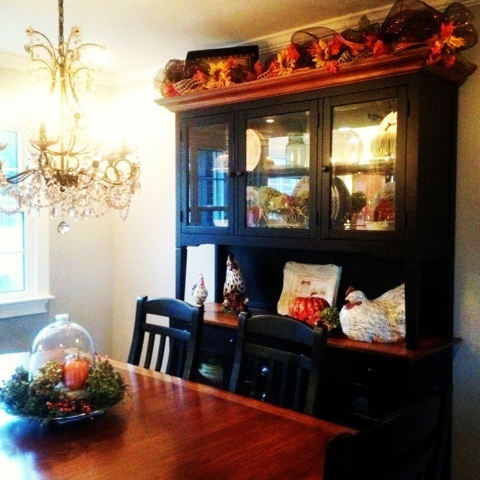 Your dining room looks so beautiful and I love your little cross stitches! I love everything. That centerpiece is wonderful!